Transit investments, by their very nature, have consequences beyond just the hardware (rails, rolling stock, stations, etc.) and the systemic improvements (unitary pay systems, new and better routes, fare structures, etc.) they support. They also build cities, enable communities, empower individuals to participate in society’s opportunities more fully. Those investments rarely lead to even outcomes and sometime create new inequities in distribution across an urban area. As the region serviced by Metrolinx is at the cusp of major investments into its transit supply and operation systems, we intend to ask what consequences the proposed funding has for the people, communities, and sub/urban municipalities it is meant to provide with better mobility. The starting point for this research lies outside the actual jurisdiction of transit funding: While the Toronto region is growing by leaps and bounds, we have become aware that such growth occurs increasingly in ways that create more socio-economic and socio-spatial inequalities. Research has found that while the share of middle income groups in the region tends to shrink while income polarization is producing more wealthy people at one end and more poor people on the other. Often, the areas with the fastest rising, and most concentrated poverty are also the least well served by mobility infrastructures. This is where our research comes in. We ask specifically whether and how planned transit investments under the Big Move can serve to stave off additional inequalities, whether they might, in fact, improve the situation of people in – often suburban – “transit deserts,” or whether they might, at a minimum, not make things worse for the most vulnerable and immobile groups on our growing city. There are socially and economically vulnerable populations in the Toronto region, who are especially impacted by transit investments and, most pointedly, the lack thereof. Our proposed research will focus on decoding the socioeconomic and political forces with the aim of “connecting the disconnected”: re-connecting vulnerable populations living at the physical and economic periphery of the region to mobility, and re-connecting public policy objectives with public transit investment priorities. Toronto has been considered to be one of a few dozen “global cities,” financial centres and decision making hubs of the global economy. It is from here that the Canadian economy has traditionally been articulated with the world economy. In this age of accelerated globalization, mobility in and of city regions has been seen as crucial for success in inter-urban and inter-regional competition. In this context, Toronto has experienced a series of severe bottlenecks in terms of its transportation infrastructure. The Province of Ontario’s Regional Transportation Plan (RTP) – The Big Move – is an ambitious plan aimed to improve, if not remove entirely, such bottlenecks. Specific vulnerabilities are linked to systemic patterns of disconnectedness in this situation. These patterns are caused by long-term biases in transportation and infrastructure investments that have led to “transit deserts” that tend to be concentrated in “in-between cities” or “third cities”, those that are not just neglected by mobility infrastructures but are generally socially and economically disadvantaged through lacking employment opportunities, substandard housing, underfunded educational institutions, limited food retail and nutrition choices, and overall disinvestment (Young, Wood, Keil 2011). Tendencies towards a polarized and segmented infrastructure supply and wildly differentiated accessibility of mobility systems is exemplary of a larger trend towards “splintering urbanism” in which “glocal” bypasses become the norm in a system that prioritizes privatized, globalized and corporate forms of transportation infrastructures over public, locally sensitive and cooperative modes (Graham and Marvin 2001). Mobilities in the post-suburban metropolis are built with and for certain privileges. Neighbourhoods are defined, among other things, by their accessibility and connectivity with other parts of the metropolis and with places beyond their borders. Most infrastructure decisions are made on the basis of connecting prime network spaces in the urban area (Graham and Marvin, 2001). 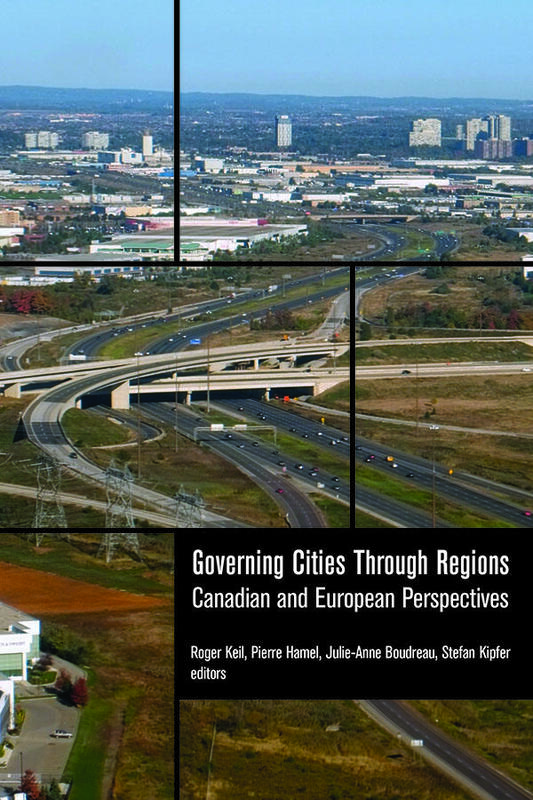 Some of these developments have been linked directly to the emergence of neoliberal forms of economic governance that favour profit and efficiencies over fairness and equity in transportation policy decision-making (Boudreau, Keil, Young 2010). 1. Greater Toronto Suburban Working Group coordinators Sean Hertel and Roger Keil, in collaboration with MES student Michael Collens, have just released a report on transit equity and justice in Toronto. This report, based on research funded by Ontario’s regional transportation agency Metrolinx, that can be downloaded in its entirety below provides a survey of existing research and practice on transit equity and justice. Using insights and examples from around the world, the report notes the importance of making equity concerns a priority in transit planning. It is meant to inspire debate on transit equity in the Greater Toronto and Hamilton Area more generally, and was the basis of an expert workshop on the topic hosted by the GTSWG on Tuesday, March 31 in Toronto. 2. Next Stop: Equity – Routes to Fairer Transit Access in the Grater Toronto and Hamilton Area is a landmark report released by CITY in February 2016, urging a call to action for transit equity, as the Province of Ontario continues to roll out a $50-billion investment in 1,200 km rapid transit across the GTHA. The report is a response to widening gaps between affordable housing and employment opportunities that have converged, in combination structural decades-long social inequities that have persisted and worsened in the urban periphery, to make transit service disparities especially severe in suburban areas. Overall, the historic lack of transit investment means many living in the “inner ring” or “905” suburbs of Toronto must either have access to a car or find a home somewhere else. Keil, Roger. (2015). Suburbs and the New Urban Century. Ontario Planning Journal, 30 (4). P. 23. Gupta, Rahul. (2015, Oct. 15). Helping more people access transit doesn’t need expensive solutions, advocates say. Toronto, ON: Etobicoke Guardian. Gordon, Geordie. (2016, Feb. 03). Regional Transportation Plan Review: Transit Equity In The GTHA. Novae Res Urbis, Greater Toronto Edition 19 (5). Pp. 1, 5.